Gayle Roberts, a 1981 chemical engineering graduate of Iowa State (Stanley Consultants photo). 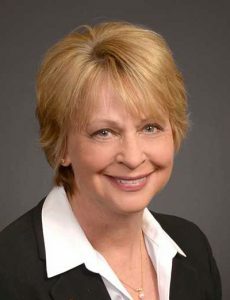 Department of Chemical and Biological Engineering alumna and noted advocate for women in the field of engineering, Gayle Roberts continues to leave a legacy in the industry. Roberts, who is now retired after serving as president and CEO of engineering firm Stanley Consultants, has been featured in a recent story by Engineering News-Record (ENR) Midwest. 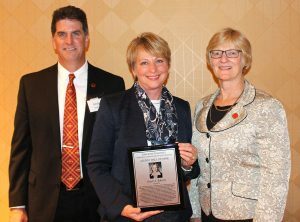 Roberts is presented with her Department of Chemical and Biological Engineering Hall of Fame plaque during her induction in 2017. She’s joined by Reginald R. Baxter Endowed Department Chair Andrew Hillier and James L. and Katherine S. Melsa Dean of Engineering Sarah Rajala. Roberts, who received a B.S. in chemical engineering from Iowa State in 1981, went to work for Stanley Consultants as a junior engineer after receiving that degree. She also received an M.B.A. from St. Ambrose University and rose through the ranks of the global firm that provides planning, design, consulting, construction and management services to clients around the world. She became the fifth president in the company’s history and its first female president. As the ENR Midwest story points out, though she is retired from Stanley Consultants, she is not about to step down from encouraging young people to consider engineering as a career, and more importantly, encouraging young women to embark on that path. She tells young women to “have courage” in their pursuit of an engineering career in a field that has always been dominated by men. Beyond encouraging just women to look at engineering, Roberts is also on a mission to encourage diversity in a broader sense in the field. Roberts received the Professional Achievement Citation in Engineering (PACE) award from the Iowa State University Alumni Association and served three terms on the Department of Chemical and Biological Engineering Advisory Council, including a term as chair. She also served on the board of the university’s Engineering Policy and Leadership Institute. Other honors and awards are mentioned in the ENR Midwest story. Congratulations on your retirement. When we retire from a job, retire to a new job – promoting our profession and doing volunteer work. Enjoy life.